Ensconced with enormously sensual, spicy, warming, lemony and peppery aroma, Gingergrass essential oil is extracted from the aromatic and herbaceous grasses of Cymbopogon martini var. sofia, the most loved sibling of Palmarosa known as Cymbopogon martini var. motia. It is also beckoned as the most popular botanical cousin of Lemongrass. Gingergrass oil has excellent properties for nurturing healthy skin and it is for this reason, it has been used for centuries together in making Indian soaps for treating acne, wrinkles, scars and marks. 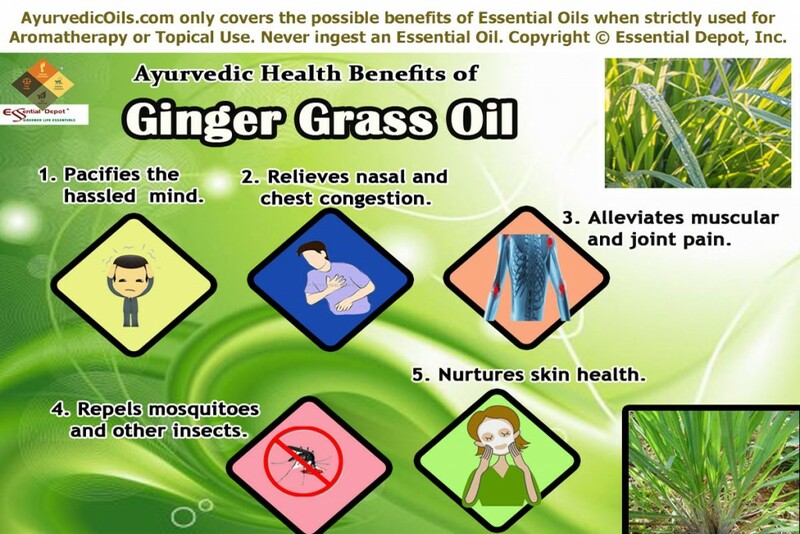 Indigenous to India, Gingergrass and its extracts, including its essential oil is a time-honored ingredient of numerous Ayurvedic formulations prescribed for the treatment of inflammation, sinusitis, allergies, joint pain, muscular aches, sore throat, depression, loss of libido, dermatitis, acne, cough, common cold and certain other health disorders. Gingergrass is called as Sofiya in Sanskrit. Gingergrass (Cymbopogon martini var. sofia) is a thickly growing perennial grass variety that reaches up to a height of 2m and is found growing in the wild, especially in lower altitudes. Gingergrass essential oil is steam distilled from its aromatic grass in India since the 18th century. The herbaceous, sharp and woody aroma have paved ways for its use in making perfumes, colognes, soaps, herbal medicines, ointments, toiletries and skin care ranges. A multilingual multi-script plant name database sorting Cymbopogon names quotes, “Two kinds of oil can be obtained from Cymbopogon martinii; Palmarosa oil from the variety known as “Motia” and Ginger-grass oil from “Sofia.” It has also been mentioned that these two types are differentiable both aromatically and morphologically, where Motia variety is diploid and Sofia is tetraploid. The major therapeutic properties of Gingergrass essential oil are analgesic, anti-fungal, anti-inflammatory, antiseptic, aphrodisiac, uplifting, bactericidal, anti-depressant, revitalizing, decongestant, anthelmintic and insect repellant. The chemical constituents contributing to its healing powers are geraniol, trans-p-menthene-8-diol-1,2, cis- and trans-dihydrocarvone, cis- and trans-carveol, menthadienols limonene oxide and piperitenone. The grassy notes of this oil are due to the presence of Perilla alcohol, meaning dihydro cuminyl alcohol. This ancient healing system means ‘knowledge of life’ and aims at treating an illness after analyzing the root cause lying behind so as to help humanity to prevent such illnesses in the future. Health in Ayurveda means the wellness of the mind, body and spirit as it trusts that a healthy mind can survive only in a healthy body supported by a hale and hearty spirit. The modesty of Ayurveda vests in its way of treating every individual in a unique manner even if it is for the same illness. According to Ayurvedic texts, every human on earth is unique with a distinct individual constitution and similarly the way of treating human beings should also be unique according to his constitution, which is made up of three biological energies known as doshas. Everything on earth (including human beings) is made up of five vital elements namely air, water, fire, earth and space. Doshas are nothing but a combination of these vital elements. Vata is a combination of space and air and governs the functions of the respiratory system and nervous system; Pitta represents fire and water and takes care of digestion, absorption and cognitive functions; Kapha stands for water and earth and is responsible for structure, movement of fluids in the body and sustenance. Every individual has a predominance of any one of these doshas that determine their personality and traits. Balance between these doshas denotes health and imbalance due to change in lifestyle and food habits cause sickness. Ayurvedic remedies like essential oils, herbs, yoga, physical exercises, prayers, meditation and Ayurvedic routine are prescribed according to the individual constitution in such a way to treat doshic imbalances. Gingergrass essential oil is said to lessen vata, pitta and kapha energy. Gingergrass essential oil has a sensual and warming aroma that calms the stressed, tensed and confused mind. Most often used for alleviating anxiety and depression, the citrusy, peppery and spicy fragrance of this oil assists in revitalizing your nerves and uplifting your senses. Massaging your body with 5 drops of Gingergrass oil mixed with 2.5 ml of almond oil can be of great assistance in lessening fatigue, anxiety, stress and depression. The greatest news is that Gingergrass oil can implant complete freshness, happiness and a clean feeling even on a damp and drenched rainy day. All you need to do is to add 2 drops of Gingergrass essential oil to your room freshener and spray it to recharge your mood with absolute newness on a dull soggy day. Cold, cough, allergies and sinus congestion can rule your routine tasks, as you might find it difficult to concentrate on your work with such respiratory problems. The best thing that you need to do is to use a safe decongestant and expectorant that assists in discharging the mucous and phlegm deposits that lead to cough, cold, congestion and breathing difficulties. Increased kapha dosha is responsible for respiratory problems, stagnation of water, phlegm and mucous deposits. Gingergrass essential oil is said to lessen kapha dosha and is a good expectorant, decongestant, bactericidal, antiseptic and anti-inflammatory. Adding 2 drops of this oil in steam inhalation can help you in relieving from blocked nasal passages, sinus congestion, headache and congestion. You can also add 1 drop of Gingergrass oil to your vapor rub and gently massage your chest, throat and back to get rid of throat allergies, dry cough, stuffy nose and watery eyes. With its antiseptic and bactericidal properties, Gingergrass essential oil aids in arresting the growth of microbes causing respiratory infections. Most of us complain about back pain, headache, muscular pain or joint pain at the end of the day, after struggling for a full day with our official and household chores. Human body is the most delicate and sensitive set up. Often, we forget to give the priority that our body requires and our mind looks up to. Mix 5 drops of Gingergrass essential oil with 2.5 ml of olive oil and gently massage your body and leave it for 15 minutes, followed by a warm bath (add 2 drops of Gingergrass oil in bathing water as well) before going to bed. Trust me; this will create a great difference in the quality of your sleep and the kind of relaxation your body can get after a tiring day. This massage and warming bath helps in promoting blood circulation, eliminating toxic substances in the body causing pain and inflammation and supporting muscular relaxation. Gingergrass and its extracts have been used as a powerful insect repellent and as the most effective natural aid against mosquitoes since the ancient times. A 1994 study was conducted on the ‘Repellent action of Cymbopogon martinii martinii Stapf var. sofia oil against mosquitoes’ by the Malaria Research Center, India to assess the repellent action of Gingergrass essential oil against mosquitoes under field conditions. The results of this study depicted that Gingergrass oil has strong repellent power and it granted complete protection for 12 hours, against Anopheles culicifacies mosquitoes, which is the primary vector of malaria in India. It also said that this oil showed about 96.3% protection for 12 hours against a pest mosquito type. The best way to keep away from mosquitoes and other insects like bugs is to add 2 drops of Gingergrass oil to your diffuser or burner. How can something with the touch citrus be less benefiting to the skin? Absolutely not, Gingergrass essential oil has a lemony aroma and the citrusy touch in its therapeutic properties has excellent benefits for the skin. With its antiseptic, anti-fungal and bactericidal properties, Gingergrass oil is effective in treating pimples, black heads, boils, cuts, dermatitis, burns, ringworm, athlete’s foot, wounds and other skin infections. Just like Palmarosa essential oil, Gingergrass oil is also said to be effective in treating marks, scars and wrinkles. Mix 2 drops of Gingergrass oil in your skin care cream or lotion and apply it the affected parts for effective results. You can also add 2 drops of Gingergrass oil with 1 ml of olive oil and massage it gently on your skin and leave it over for 30 minutes, followed by a refreshing bath can help in improving your skin tone, reducing marks and scars, augmenting the circulation and regenerating the formation of new skin cells. Gingergrass essential oil also has aphrodisiac properties that assist in treating loss of libido, impotence and loss of sexual interest along with clearing cluttered thoughts in the mind that weaken the intimacy with your partner. This oil is also used in making perfumes, soaps, colognes and other skin care products. This article is only for the purpose of education and is not meant to diagnose or substitute any prescribed medication or professional medical advice. Always use essential oils in a diluted manner and never use it internally as organic and pure essential oils are highly concentrated solutions and can cause harm if not used properly. Gingergrass essential oil has slight phototoxic effect like the citrus oils, so do not go out in sun immediately after using it topically, to avoid the harmful effects of ultraviolet rays. Consult your Ayurvedic expert before choosing the appropriate essential oils for your unique health condition and individual constitution. This entry was posted in Essential Oils - Learn About and Purchase and tagged Ayurvedic health benefits of Gingergrass essential oil, Ayurvedic insect repellents, Ayurvedic oils for anxiety, Ayurvedic oils for breathing difficulties, Ayurvedic oils for common cold, Ayurvedic oils for depression, Ayurvedic oils for fungal infections, Ayurvedic oils for joint pain, Ayurvedic oils for loss of libido, Ayurvedic oils for muscular pain, Ayurvedic oils for sinus congestion, Ayurvedic oils for skin care, Ayurvedic oils for stress, Chemical constituents of Gingergrass oil, Ginger grass oil, Gingergrass oil in Ayurveda, Health benefits of Gingergrass essential oil, Insect repellents, Mosquito repellents, Therapeutic properties of Gingergrass oil by AyurvedicOils. Bookmark the permalink.